Have a Super Bowl party, celebrate a playoff game, invite friends and dogs over to watch a college game...or any game for that matter. You can even furnish special beer for dogs to enjoy with their treats (if you want to go over the top!) and other party items to turn it into an event that your everyone will talk or bark about. There are dog sized jerseys with the pro football team logos, football team logo dog collars, and college team logos. Pre-heat over to 350 degrees. In mixing bowl, combine package doggie biscuit mix with water and oil. Mix well. The mix will be stiff and dry. If it happens to be too stiff, add in a small amount of water. 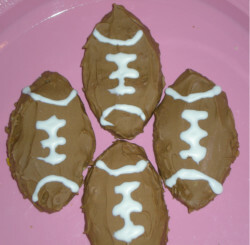 Roll out the dough and use football cookie cutters to cut desired shapes. Place on pre-greased cookie sheet and bake for 18-22 minutes on middle rack. Turn off oven heat and leave tray sitting in oven for 60 more minutes to dry out and harden the dog biscuits. Mix the dog treat frosting for piping and pipe white lines to simulate football laces onto the dog cookie. 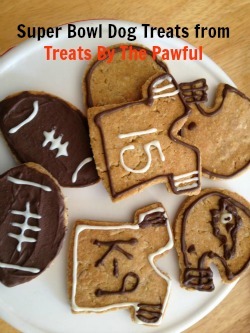 These Super Bowl dog treats were baked by the Treats By The Pawful dog bakery in Minooka, Illinois.